The bridge is now almost fully open and boats will soon be able pass. The only access onto Heigham Holmes, an isolated marsh since 1987 owned by the National Trust, is via a floating bridge over the River Thurne. Before the first pontoon bridge was constructed in the 19th century, the river had to be crossed by boat. The first "ferry" is described as having been a large raft which required three people to operate it. In 1926, the farmers who owned land on this man-made island decided to improve their access and on 7 September signed a document which declared that "Each proprietor shall forthwith on signing this agreement pay to an account to be called the Martham Holmes Floating Bridge Account a sum proportionate to his or her acreage of such amount as may be required to provide a floating caisson bridge with all necessary fittings, gear and appliances." In 1987 a new bridge, operated by pulling on a chain, was constructed. Like the caisson bridge it replaced, it had to be left open so as not to obstruct river traffic and it was for this reason necessary to row back to the other side after crossing over, in a boat provided for this purpose, to re-open it, and then to row across the river once again before the journey could be resumed. 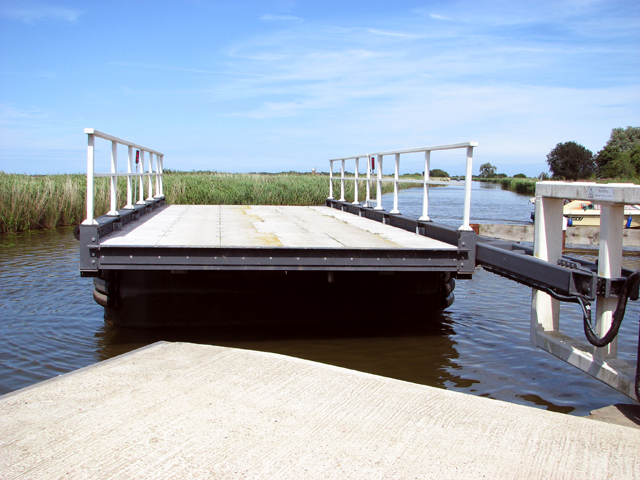 The latest incarnation is an automated floating bridge which was installed in 2012. It has a tank beneath it which is filled with water. The weight lowers it to the level of the road and it can now be crossed > Link . To open it, the water is pumped out, the bridge rises > Link - Link and can then be swung sideways > Link - to let boats pass >Link - Link - Link - Link . For a view of the old bridge which dated from 1987 see > Link . Although there are no records of a commercial ferry ever having operated here this river crossing has always been known as Martham Ferry.